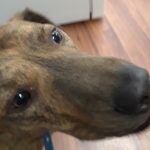 Happy Tails For Ralphy Boy – A.A.R.F. 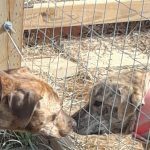 – All About Rescue and Fixin' Inc.
How is your adopted pet doing? Ralphy is doing very well. When I first got him, he seemed a little under weight as his back bone vertebra and ribs seemed very prominent. (His foster mom said he had been a picky eater.) His appetite has increased. He eats about five or six cups of dog food per day (any brand I purchase), and has gained a few pounds so he looks very healthy and athletic. 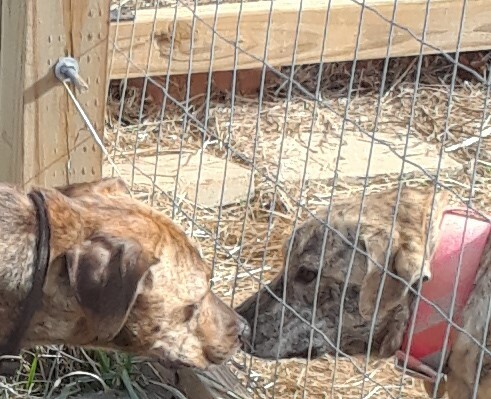 He loves his sister Marble, (also a Mountain Cur). They love to run and play in the back yard. Ralphy likes to watch Lucie the cat, and will lay on the bed with her. Ralphy is beginning to trust his new pet parent. He comes in when called, comes to her when he wants to be petted, and responds to basic commands. Thanks to his foster mom, walks very well on a leash, and is perfectly house trained. He walks to the door when he needs to go out and he sits quietly in his crate and does not make a peep when I am teaching via internet. He is learning to trust my adult daughter, and adult son. Every day Ralphy is acting less like a frightened abused stray, and more like a member of the family. I believe that within a few months – perhaps by the end of spring, all traces of fear based behavior will be gone and he will be acting as if he has been well-treated all of his life. He is such a great dog, and so eager to please. Adopting Ralphy was a great decision.